We’d love your help. Let us know what’s wrong with this preview of Texas Splendor by Bobbi Smith. An Easterner born and bred, Trista Sinclair falls in love the minute she lays eyes on the open Texas terrain of her fiancé’s ranch. But the whispers she hears from corral hands about unseen dangers come instantly to life when she is captured while out riding. The blue-eyed Comanche warrior takes her. He is a broad-chested brute of a man whose sensual touch she finds more dangerous than anything. HE WANTED HER HEART AND SOUL. . .
Until he sees Trista Sinclair, the fierce warrior Lance Barrett has never been tempted to take a captive. As Trista Sinclair is his half-brother's untouched fiancé, she poses the perfect way for him to get revenge against the white father who rejected him and the half-brother who berates him. Yet what Lance wants most is the one thing Trista swears never to give—her willing surrender. This beautiful woman has hair like spun gold like a magnificent stallion and the backbone to boot! She will come to me when her heart is full. 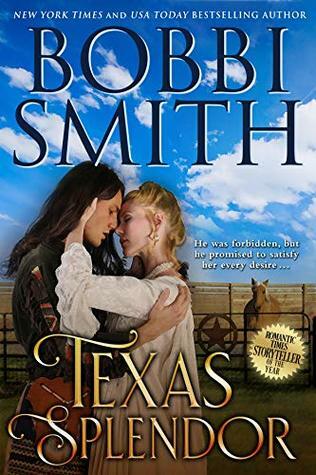 This edition contains an excerpt of THE LADY AND THE TEXAN by Bobbi Smith. Bobbi Smith is a New York Times and USA TODAY bestselling author with more than 6 million books in print. She has been awarded the prestigious Romantic Times Storyteller of the Year Award and two Career Achievement Awards. Since she sold her first book, Rapture’s Rage, in 1982 she has published more than 38 books and contributed to six collections of short stories. When she’s not on deadline, Bobbi teaches writing at The Write Stuff at the University of Missouri, St. Louis, and is a frequent guest speaker for writer’s groups. Her western historical romances appeal to readers of C. J. Petit, Shirleen Davies, and Judith E. French. Bobbi Smith is the mother of two sons and lives in St. Charles, Missouri, with her husband and three dogs. To ask other readers questions about Texas Splendor, please sign up. I loved this book. Trista was captured by Lance, a half breed Comanche. They ended up falling in love and married. Lance also caught a horse, Fergo, but the horse escaped and is now free. I would recommend this book, and I know I will read again. 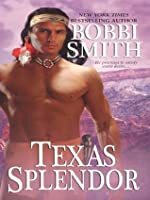 I've never read a historical romance involving Native Americans before and I'm thrilled to discover Bobbi Smith's books. This book was so good I gave it to my mother-in-law, who doesn't usually read romance, and she loved it too! After working as a department manager for Famous-Barr, and briefly as a clerk at a bookstore, Bobbi Smith gave up on career security and began writing. She sold her first book to Zebra in 1982. Since then, Bobbi has written over 40 books and several short stories. To date, there are more than five million of her novels in print. She has been awarded the prestigious Romantic Times Storyteller of th After working as a department manager for Famous-Barr, and briefly as a clerk at a bookstore, Bobbi Smith gave up on career security and began writing. She sold her first book to Zebra in 1982. Since then, Bobbi has written over 40 books and several short stories. To date, there are more than five million of her novels in print. She has been awarded the prestigious Romantic Times Storyteller of the Year Award and two Career Achievement Awards. Her books have appeared on numerous bestseller lists. When she's not working on her novels, she is frequently a guest speaker for writer's groups. Bobbi is mother of two sons and resides in St. Charles, Missouri with her husband and three dogs.